Both the H80i GT and the H100i GTX are based on the common configuration of a radiator, two hoses and one block that combines the CPU contact plate and the pump. The H80i GT is designed to take a single 120 mm slot while the H100i GTX requires two adjacent 120 mm slots. For both of these liquid coolers, Corsair ditched the standard thin corrugated/rubber tubing and is using thick braided tubes instead. The internal diameter of these tubes is not really larger, but they are more resistant to kinks and have significantly greater mechanical strength. The main (and virtually only) physical difference between the H80i GT and the H100i GTX is the radiator. Both radiators are based on the same core design, a dual pass cross-flow configuration with wavy fins attached to the thin oblong tubes. The H100i GTX has a 276 mm long radiator that is 30 mm thick and can hold two 120 mm fans on either of its sides. The radiator of the H80i GT is 154 mm long and capable of holding one 120 mm on either of its sides, but it also is 49 mm thick, making up some of the lost mass. 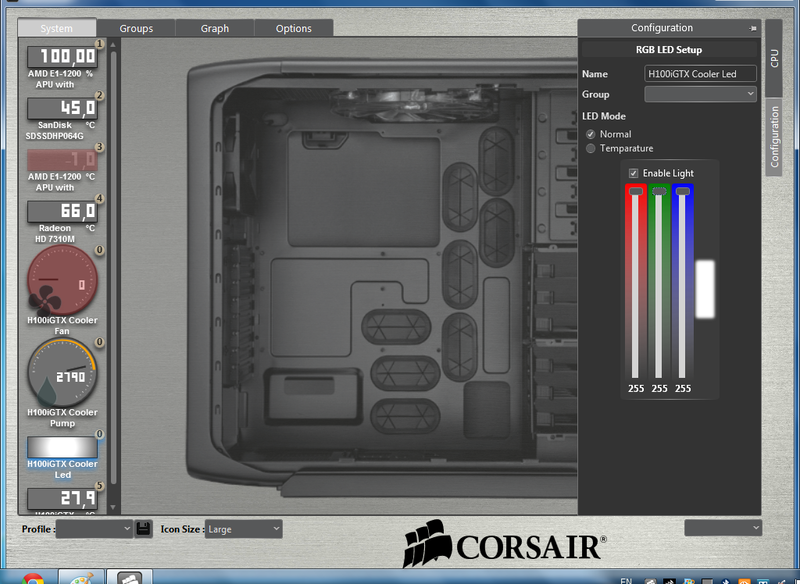 The thickness however increases the airflow impedance of the radiator significantly, which is why Corsair is supplying two 120 mm fans with the H80i GT to be used in a push-pull configuration, in order to maintain practical pressure and airflow levels. The 30 mm radiator of the H100i GTX has significantly lower airflow impedance and thus a push-pull configuration would not have a significant effect, particularly considering the already high pressure of the supplied SP120L fans. Both of the coolers we review today share the same pump/block assembly. It is mostly made out of plastic, with an octagonal piano black top and a circular base. A grey cover with a semi-transparent company logo can be seen at the top. RGB LED lighting is installed beneath this cover, illuminating the company logo along with the top and the bottom side of the grey cover. The copper contact plate is attached to the circular base of the block with eight screws. Thermal material is pre-applied to it and it comes with the Intel CPU mounting retention bracket from the factory. A retention bracket for AMD CPUs is included in the box. 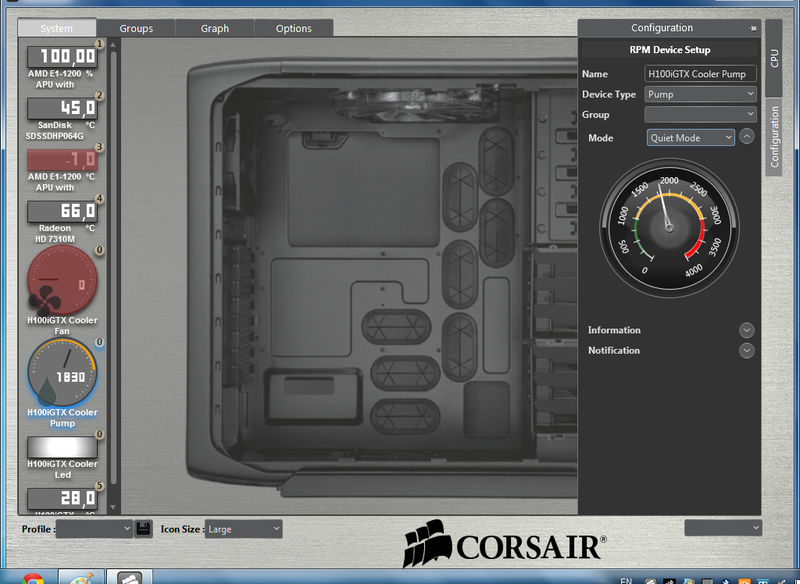 One of the most important features of these two coolers is the Corsair Link support. By attaching the provided USB cable to an internal header on the motherboard (or to the Corsair Link Commander, if one is available), the user has direct control over almost everything regarding the coolers. The LED color can be changed manually or can be linked to a temperature, the speed of the pump and the cooling fans can be configured and custom cooling schemes can be programmed as well. The speed of the pump or fans can be set to one of the pre-programmed modes (e.g. Quiet, Performance, etc. ), to a fixed speed or a custom cooling curve can be manually created.